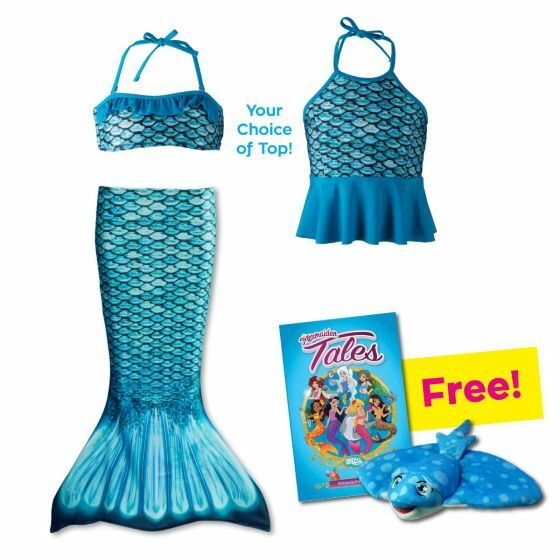 Give her everything she needs for unforgettable childhood memories with Fin Fun’s specially created gift set for toddlers featuring a Tidal Teal mermaid tail skirt, swim top, & free bonus items! Get little sister in on the mermaid magic with our exclusive gift set featuring our best-selling Mermaidens design, Tidal Teal, in a toddler mermaid tail skirt and matching swim top! She’ll adore looking just like an ocean princess dressed in beautiful aqua and teal scales! Plus, mom and dad can get in on the fun by reading Mermaiden Tales to their sweeties right before bedtime. Chances are high that the bonus plush toy will be nestled safely in bed during story time!